On Sunday, my best friend and I planned a brunch double date with our husbands. When I woke up, a texting session commenced regarding where we would be eating. We each threw out a few options and settled on Cafe Estelle. Cafe Estelle, on North 4th Street, is one of their favorite spots, but we hadn’t been there yet so I was eager to check it out. When we got to 4th street, we weren’t exactly sure where it was located until I called my friend, Farish. As it turns out, Cafe Estelle is actually inside a large condo building on 4th street (which is apparently quite pet-friendly due to the large number of dogs I saw coming in and out.) We parked and went inside for a table, yet were told that we had to wait for our entire party. Once they arrived, we were seated quickly and I began perusing the menu. I was immediately intrigued by the unique offerings like a gorgonzola, bacon and apple breakfast pizza (!) and shirred eggs with mushroom, spinach, cream and truffle oil. As we were checking out the menu, our waitress came up to take our drink order. My friends, who eat there often, mentioned that she was new and we definitely saw a few service glitches including a lack of cup for my coffee–I used to waitress in high school and coffee is the one thing you CANNOT forget on a weekend morning! Once I got my cup, I walked up to the cute, DIY coffee bar. They had four different types of coffee, including one decaf. I was impressed by the various offerings including a Costa Rican blend and the detailed descriptions of all the varieties. I opted for the Costa Rican blend due to many enjoyable cups of during our trip to Costa Rica a few years ago. I had some difficulty deciding what to order. Did I want to stay simple and get the 2 eggs poached, homefries and breakfast meat option for $6.50 (I love poached eggs!) or did I want to go with something a little fancier. I ended up opting for the shirred eggs as I kept eyeing them up on the menu. I also got a side order of turkey sausage as I’ve heard great things about Cafe Estelle’s meats from my friends at Green Aisle Grocery who stock their bacon and scrapple. My husband got a version of Eggs Benedict (I want to say it was called Eggs Estelle…) with artichoke and prosciutto, Farish got the fruit, yogurt and granola platter with a side of one scrambled eggs and wait till you hear what Tre got…apparently Cafe Estelle has BACON PANCAKES. 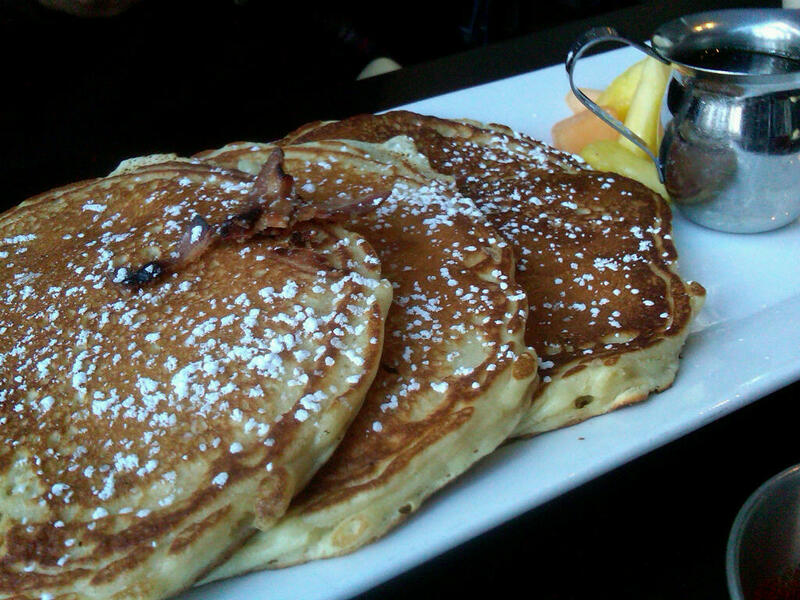 It’s not on the menu, but you can order their buttermilk pancakes with big chunks of bacon in them! That is one of Tre’s favorite menu items there so he thought he’d go with the old standby. 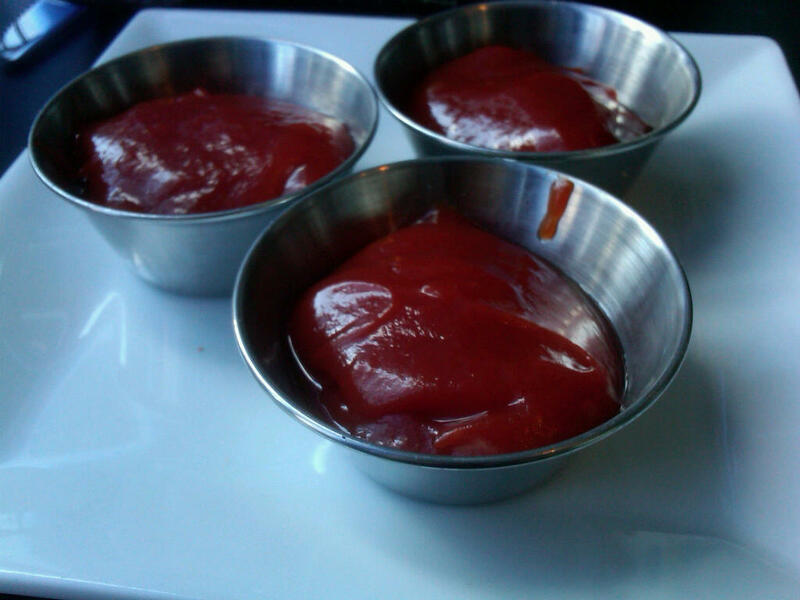 While we were waiting for the meal, our waitress dropped off a little dish of ketchup. I don’t know why I found this so adorable. Our food came out pretty quickly. 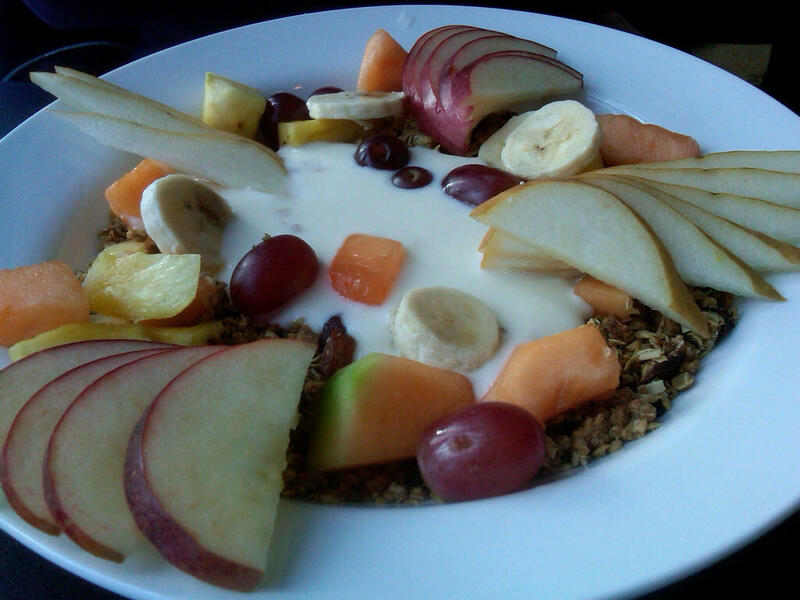 Check out Farish’s granola. I didn’t taste it but doesn’t it just look so pretty? My husband enjoyed his egg dish, although I didn’t taste that either. He was a member of the clean plate club, so I’m assuming it had to be good. I got a quick bite of Tre’s bacon-laced pancakes–making sure the bite was soaked with maple syrup and had a chunk of bacon. These pancakes were really, really good. I’m not normally a pancake eater because I like a little more variety on my place (i.e. an egg dish has eggs, potatoes, toast, etc.) but I would definitely order the bacon pancakes in the future. The pancake was light and fluffy with the sweet and chewy bacon. Bacon pancakes? Best idea EVER! Check out the little piece of bacon sticking out from the pancake on the left. Finally, the shirred eggs! 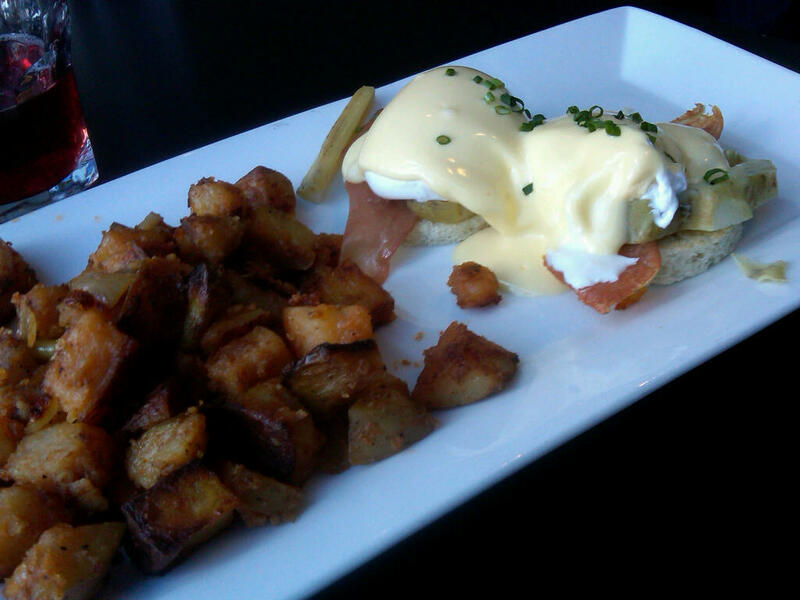 When I ordered them, the waitress made sure to explain what shirred eggs were. While I was familiar with them, I’m guessing she did that because past guests were surprised or turned off by the runny yolk. I love runny yolks! The dish that arrived at the table was a sigh to behold. In general, all of Cafe Estelle’s food looked really, really good and I appreciated their attention to detail when it came to plating. What’s the verdict? I liked the dish. It was good. Unfortunately, it did not reach the high hopes that I had for it. One major issue was that it sounded so flavorful and yummy on the menu but it really lacked flavor including the highly anticipated truffle oil. Have you ever had a dish that was good and fine when you were hoping for great? That’s exactly what this was. In addition, the homefries (which are one of my favorite breakfast items) were soft and flavorless. I like a good, crunchy potato dish OR at least one that is chock full of flavor. Last, and this is just me being whiny, but I prefer a traditional piece of toast with my breakfast while Cafe Estelle serves cute little pieces of baguette. 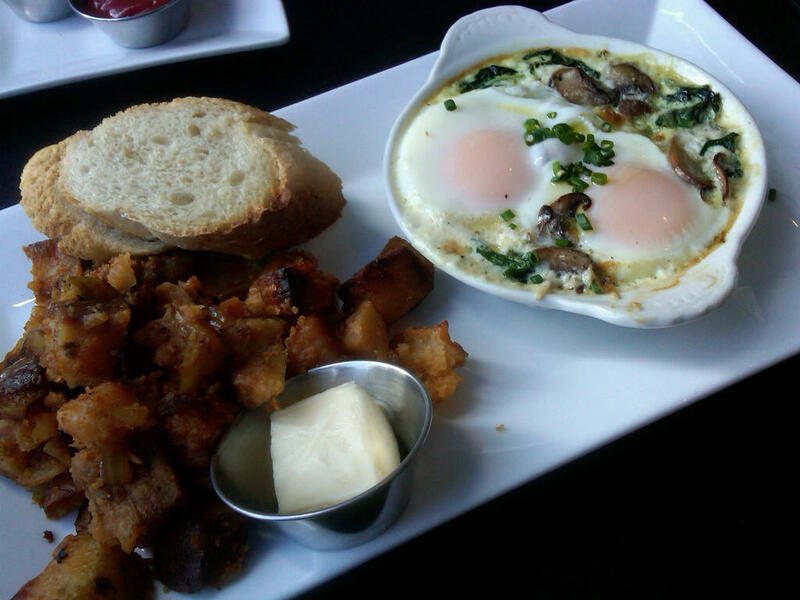 With a dish like this, I would have liked a little more square footage with which to sop up my eggs. And the turkey sausage. The turkey sausage came as two small patties that looked almost like turkey sliders. While they were good, they tasted more like turkey burger than turkey sausage. I was kind of bummed because I had a different idea of what the sausage would taste like. In short, it sounds like I had a poor meal at Cafe Estelle, but overall I quite enjoyed myself. I think that I may have mis-ordered but would be happy to visit the bruncherie again. We got a table quickly, which is almost impossible in Philadelphia, the service was pleasant and the food was obviously fresh and made to order. My favorite part of the whole brunch was the fact that everyone who orders a coffee with their meal gets a coffee cup to go. This idea is GENIUS! I was able to fill up a to-go up with a fresh, steaming-hot cup of coffee as we braved the cold to walk back to our cars.